Lew and I started to work for KLM (Royal Dutch Airlines) in the early 1960’s, Lew as pilot, me as Stewardess. We both flew the Polar Route regularly (for which a special Polar survival training was needed in case of an emergency landing) via Amsterdam to Anchorage (Alaska) and Tokyo (Japan). The Cold War prohibited over flying Russian territory in those days. We would stay 4 days in Anchorage, 3 days in Tokyo, and the schedule repeated itself on the way back to Amsterdam. The crews had three cars at their disposal, as there was no public transport in Anchorage, and at the airport the cars were transferred to the incoming crew by the outgoing crew. These gave us great opportunities to undertake trips together in those 4 day stopovers. One day Lew came home with a small Polar Dog puppy. At the big dog show in Amsterdam – The Winner – we met Liesbeth Urlus (an ex-KLM Stewardess who herself had worked on the Polar Route) who had imported two Siberian Huskies. At that time there were two more Siberian Huskies in the Netherlands and we made an appointment to meet on the beach in Noordwijk, where Liesbeth lived, to put our dogs in front of a small rig to find out what would happen. That turned out reasonably well and with that “team” we entered the first sled-dog race in Central Europe, organised by the Swiss Breedclub SKNH in Engelberg that winter. 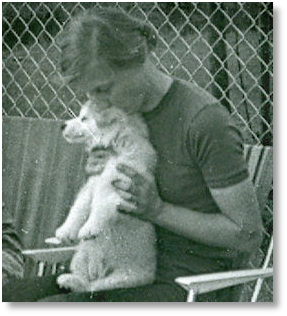 Lew started to import dogs from Alaska for ourselves and others interested in the breed and sport. He bought those dogs from Earl and Natalie Norris, living just outside Anchorage at that time, who bred and raced the Siberian Husky with a lot of success. The breed club was founded in the Netherlands. More races were organised in Central Europe and the enthusiasm for the sled-dog breeds and the sled-dog sport really took off. 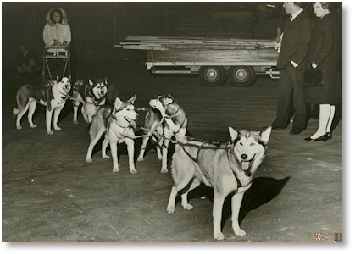 In first instance only the pure-bred sled-dogs – Alaskan Malamute, Samoyed and Siberian Husky – were admitted to the races which were organised by the Polar Dog breed-clubs. But eventually the example of the Scandinavian sport-clubs was followed, admitting dogs of all breeds to the races. 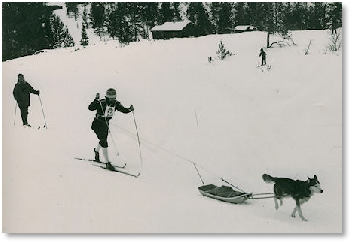 Keep in mind that the sled-dog sport in Scandinavia had been established a long time. Meanwhile we had applied for a Kennel registration – of Kolyma (affix) – and I had successfully finished my exams for qualified FCI judge for the Alaskan Malamute and Siberian Husky. Our kennel was established in Harksamp, giving us the space to keep and breed our dogs and the training trails to work them. 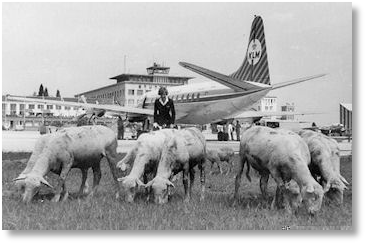 Els clearing sheep from the runway at Rotterdam airport - how times have changed! After 20 years of breeding, training and racing ours dogs with great satisfaction and joy, the sport became too great a physical effort Lew and myself to keep up. 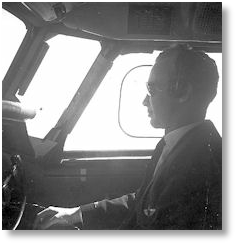 Lew had a tough job as check pilot, and his captaincy kept him away from home for more and more time. As a consequence, the job of training, raising and kennel management fell upon my shoulders. With a regular count of 25 dogs in our kennels, that was quite a job. Finally, we realized we were not able to do our dogs justice any longer, and came to the difficult decision to find them better care in good kennels. This we managed to do successfully, but believe me, it still hurts!